SoftPlanet makes it possible for everyone to get free Bitdefender Antivirus Free Edition download directly from our servers. There is no registration needed for downloading. Bitdefender Antivirus Free Edition 1.0.21.1099​ is by the words of many critics and users “The best antivirus technology available free for download and use” It is capable of protecting your computer from all the latest malware and rootkits and at the same time does not slow down the PC at all. The options and settings are reduced to a minimum, which makes this protector one of the best free antivirus programs for the entire family. It can be installed on any computer an unlimited number of times. Bitdefender Antivirus Free Edition 1.0.21.1099 is the newest edition of the software, which solve a few issues that existed in the previous versions. For instance, the Refresh time problems in ThreatControl and the denied access for read-only items when trying to Delete all quarantined files no longer exist. The developers have managed to improve the compatibility with Outpost Firewall Pro 8.1 and Windows 8.1 as well. Bitdefender Antivirus Free Edition 1.0.21.1099 continues blocking of infected email message archives after Quarantine auto-scan. Bitdefender Antivirus Free Edition can be used with English, Romanian, Portuguese and Italian language interfaces. It is very light on system resources and it can be installed on Windows XP, Vista, 7 and 8. The application has a real time shield, active virus control, an intrusion detection system, B-Have proactive detection, HTTP and early boot scanning etc. There is also a Plus edition, which is paid, but has more features than the free one. Bitdefender Antivirus Free Edition has a very tight and compact user interface. On the first run you will probably notice that the name, the version and the last update are displayed on top of the program's window. There are also four tabs, which are called Virus Shield, Auto Scan, My Bitdefender and Product Update. The last one is there, because the free version which you will probably download and install is not the latest. Thus by pressing this tab you will restart your computer and the antivirus program will update to the latest available edition. The My Bitdefender tab shows if you are logged in or not. If you click on that tab the online dashboard will be opened and there you will see more information about the protection system which you use. 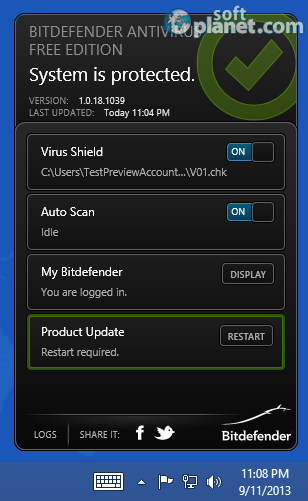 Bitdefender Antivirus Free Edition does not have built-in help. You can obviously turn off the Virus Shield and the Auto Scan with the slider buttons. Also the little button in the lower left corner called LOGS can be pressed, which turns the program's log on. 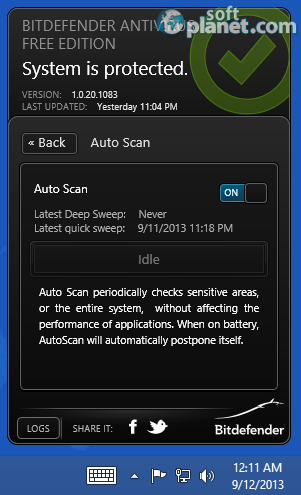 By clicking on the Auto Scan tab you will see when the latest deep and quick sweep was. There is also a note which informs you that when your PC runs on battery this feature will be postponed. Bitdefender Antivirus Free Edition 1.0.21.1099 is a nice antivirus solution, which does the job what it has been created for without interrupting you all the time. The limited options may refuse some users, but let's not forget that this is a free product, which is very effective actually. Bitdefender Antivirus Free Edition is VIRUS-FREE! 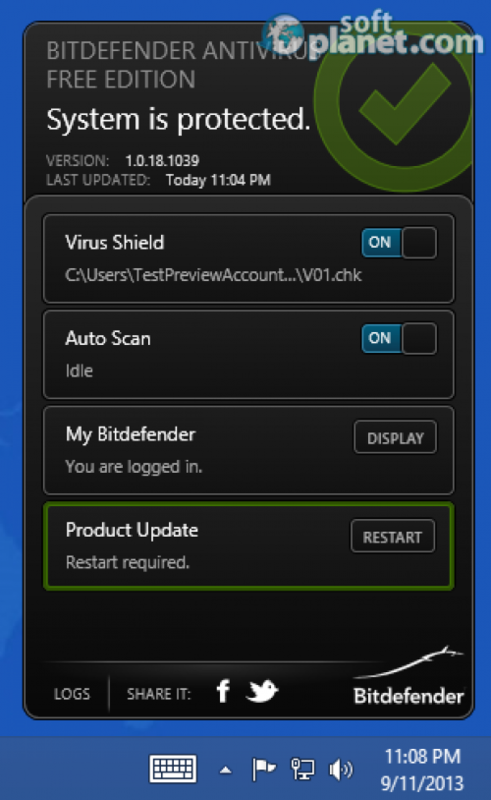 Our security scan shows that Bitdefender Antivirus Free Edition is clean from viruses. The current version of Bitdefender Antivirus Free Edition has been scanned by our system, which contains 46 different anti-virus algorithms. That ensures that Bitdefender Antivirus Free Edition 1.0.21.1099 is 100% safe for your computer.